Start.wow.com is the PUP that uses misleading techniques to prevent removal. Use Reimage to locate malicious components and get rid of them faster than with uninstall instructions. A full system scan blocks virus reappearance and prevents traffic to malicious domains. Start.wow.com is a web page that suggests using a web search engine. However, if one day it replaces your homepage address without your knowledge, understand that you have unintentionally agreed to add it to your browser when installing some free program that you recently downloaded from the web. As soon as this potentially unwanted program (PUP) gets installed, web browsers installed on the computer system start misbehaving and causing repetitious redirects to hxxp://start.wow.com/ page. Despite that this WOW Search engine is legitimate, many users do not find it useful and considering methods used for its promotion some of the users might even start calling this program a virus. That is not true, however, if you accidentally added this search tool to your browser and you’re not happy with its services, you can easily remove Start.wow.com using Reimage, Malwarebytes MalwarebytesCombo Cleaner or another reputable anti-spyware software. Results provided by the described search engine are powered by Bing, however, they might contain third-party ads as they are modified by AOL Search Network. 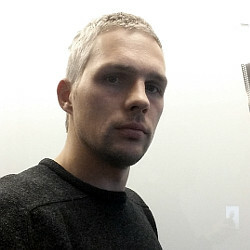 This company, which happens to be the developer of this browser hijacker says that it provides targeted ads based on the content of the website or app that the user is viewing, and calls these “contextual ads.” The company also admits that it might show “interest-based” ads that are selected according to data collected about user’s activities and interests. It turns out, this company, along with other advertising companies “may gather information about your online activities in this way to make predictions about what products or services may be of interest to you.” The company claims to be using particular measures to protect such information; however, we still suggest you to be careful. Users can choose to opt-out the use of user data for internet-based advertising. However, if you are interested in ads but you do not simply want to use the new search engine that was added without your knowledge, Start.wow.com removal tutorial (provided below) explains how to get rid of this search tool and change homepage, default search, and new tab page settings with ease. Start.wow.com search engine can suddenly replace your previous homepage address and become provider of default search as well if you tend to install free programs without paying attention to statements provided by software installers. First of all, you should try to remember what kind of software you installed recently. Programs that you added, or, to be precise, one of them should be responsible for causing Start.wow.com redirect issue. Free programs that meddle with browser settings are usually distributed along with other free software, such as Java or Flash Player, media players, or other free apps. It is your right whether you want to install such extras along free software that you need – usually, all it takes to drop them off is to remove a couple of check marks in software installation wizard. These checkmarks usually are located behind Custom or Advanced installation settings, so don’t forget to pick them when installing your desired software. Once you perform the described modifications, finish the installation without worries. To remove Start.wow.com, you should firstly read tips provided below. Although many software removal tutorials usually advise deleting programs via Control Panel, that might not be enough when speaking about browser hijackers. To complete Start.wow.com removal with success, you also need to check each affected web browser individually. Follow instructions provided below to locate and remove all programs associated with AOL and WOW. What is even more important, do not forget to fix shortcuts of affected web browsers (delete suspicious URLs from the Target field as shown below). Here, look for Start.wow.com or any other recently installed suspicious programs. Wait until you see Applications folder and look for Start.wow.com or any other suspicious programs on it. Now right click on every of such entries and select Move to Trash. When in the new window, check Delete personal settings and select Reset again to complete Start.wow.com removal. Once these steps are finished, Start.wow.com should be removed from your Microsoft Edge browser. Here, select Start.wow.com and other questionable plugins. Click Remove to delete these entries. Now you will see Reset Firefox to its default state message with Reset Firefox button. Click this button for several times and complete Start.wow.com removal. 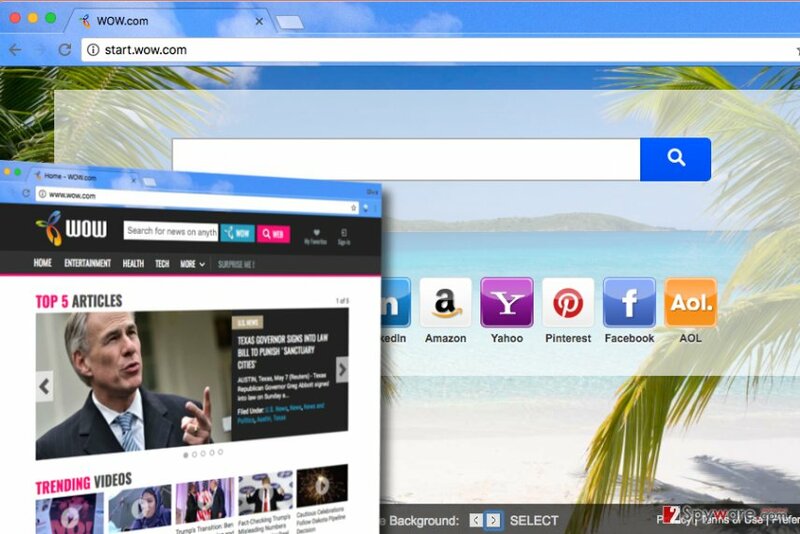 Remove WOW Homepage – Access your favorite sites extension from Chrome. Here, select Start.wow.com and other malicious plugins and select trash icon to delete these entries. Click Reset to confirm this action and complete Start.wow.com removal. Here, select Extensions and look for Start.wow.com or other suspicious entries. Click on the Uninstall button to get rid each of them. Here, look at the Homepage field. If it was altered by Start.wow.com, remove unwanted link and enter the one that you want to use for your searches. Remember to include the "http://" before typing in the address of the page. Now you will see a detailed dialog window filled with reset options. All of those options are usually checked, but you can specify which of them you want to reset. Click the Reset button to complete Start.wow.com removal process. ^ Web search engine. Wikipedia. The Free Encyclopedia. ^ Alaina Thompson. Bing Now Powers AOL Search. PPC Hero. PPC Advertising Strategy, Tips & News. ^ Contextual Advertising. Marketing Terms. Digital Marketing Reference & Research. ^ Amit Agarwal. How to Opt-Out of Interest-Based Advertising and Stop the Ads from Following You. Labnol. Tech How-to Guides, Software Tips, Gadget Reviews, Mobile App Recommendations and Video Tutorials Around All Things Tech. This entry was posted on 2017-05-08 at 09:36 and is filed under Stealing programs, Viruses. You can quickly scan the QR code with your mobile device and have Start.wow.com virus manual removal instructions right in your pocket. How did you remove Start.wow.com virus?